You can battle trainers at the Battle Tree. When you first arrive at the Battle Tree, you can battle with either Red or Green. When you first arrive at the Battle Tree, you can battle with either Red or Blue. 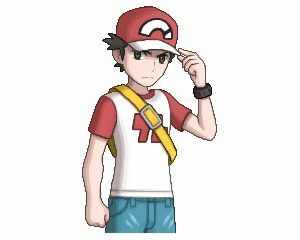 Red will appear again in the 20th battle in the Single Battles. Red will appear again in the 50th match in the Super Single. Likewise, Red will appear again in the Super Multi Battle in the 50th round tag-teaming with Green. *If you talk to Red near the entrance of the Battle Tree after you won the 20th battle in Singles, he will give you the Megastones Venusaurite, Charizardite X, Charizardite Y and Blastoisinite. The following Pokemon that will be used by Pokemon Trainer Red will be chosen at random. Since no two Pokemon of the same species may enter, only one of the possible Held Item and move sets will be chosen. Pokemon Trainer Red’s party will consist of high-leveled Pokemon, thus you are required to increase your party Pokemon’s levels first before you take on the challenge. The Pikachu Red switches out first can easily be countered with a Pokemon with the ability Lightning rod or a Ground-type Pokemon since they are immune to Electric-type moves. Therefore it is recommended to have one of these types sent out first, and if possible those which can be taught buffing moves. Others that do not have buffing moves but belong to one of these types can be used provided that you use boosting items like X Attack to compensate for it.